How do you choose the right wood flooring for your needs? Wood flooring is one of the smartest investments you can make in your home. It’s hypoallergenic, easy to maintain, and when it’s properly cared for your wood floor will last for years to come. How do you choose the right wood flooring for your needs? Here are some factors you should consider when trying to find wood flooring for your home! 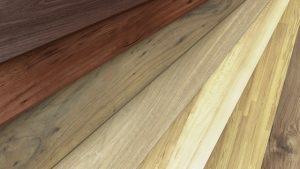 When you’re looking at different plank widths for your wood flooring, you may notice that the wider the planks are, the more expensive each individual piece is. By choosing flooring that varies in size, you can save a little bit and you’ll still end up with a beautiful new floor. Since wood flooring is a natural material, it will expand and contract with changes in temperature and humidity. Take a careful look at the wood species you’re considering and choose the one that will do best with the year-round climate in which they will be installed. Each species of wood has its own unique grain characteristics, and milling practices can change grain characteristics as well. The wider the plank, the more you will be able to see the grain pattern in your flooring. Choose a grain pattern that matches your personal style and the style of your home. Boards with lots of varied grain pattern will make for an interesting conversation piece. Without a doubt, you will want to make sure your wood flooring choice is nice and strong. The stronger the wood is, the longer it will last. If your home sees a lot of foot traffic, you may want to consider spending a bit more to get the strongest flooring that will fit your budget. This entry was posted on Tuesday, March 27th, 2018 at 4:56 pm. Both comments and pings are currently closed.